Size: 18" x 27", 24 x 36", and 28" x 42" - Select sizes options from Drop Down Box. Edition: Artist Signed and Numbered, Limited to just 48 total editions. Certificate Of Authanicity Included. 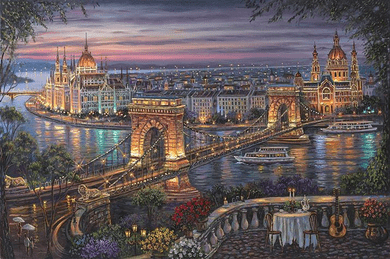 From Robert: Budapest, Hungary�s capital, is one of the most distinguished and picturesque locations in the world. In this portrayal, I envision a romantic candlelit balcony overlooking the Danube River below, twinkling from the moonlight above. A 19th century chain bridge, which looks to be radiating pure gold in the cascading evening light, expands from one side of the river, to the other. Further in the distance, you can marvel at the 13th century gothic majesty of the Palace of Castle Hill. I can almost make out the sounds of exuberant revelry which must have been maintained constantly from there in that time. Whether it be from a balcony towering above the city, or on an enchanting boat cruise winding through the river; you will certainly enjoy all the breathtaking views that Budapest has to offer.